Floor Screws | Self-Tapping & Winged Self-Drilling | ASP Ltd. Designed with the problems of different expansion rates between timber and steel in mind, ASP Floor Screws fix timber or chipboard floors to steel supports quickly and effectively. Manufactured from high carbon steel, they undergo a special hardening process which achieves a hard exterior for the formation of threads yet retains a tough flexible core. This is vital for withstanding the shock of moving loads and the severe expansion and contraction to which wooden floors are subjected in extremes of humidity and temperature. Boards are clamped neatly to the steel work – countersinking is generally unnecessary. The thread design incorporates flutes which allow the self tapping action to be achieved at torques considerably lower than those required for standard self-tapping screws. A firm fastening is completed with minimum stress on the screw. 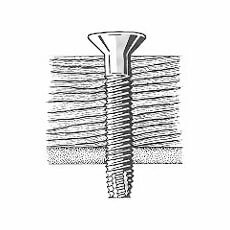 Fine threads provide a greater area of contact to the steel frame than other types of coarse-threaded floor screws. Threads are formed with minimum stress to the work piece and a neat fit between male and female threads is achieved. In most cases the self tapping action is strong enough to bed the screw head down below the level of the floor without pre-countersinking, providing a further solid hold. For best results it is essential that you should seek our advice on optional hole sizes and correct length of screw to be used. These floor screws are designed to drill a clearance hole in the timber and then self drill and tap into the steel. The wings on the drill point ream out the clearance hole in the timber but break off once they hit the steel, allowing the screw to drill the exact hole diameter for the tapping operation.